Capsule Summary: The first anniversary of peace talks enrages Hawkeye so he decides to write a letter to President Truman, telling the President all about what’s going on at the 4077th. This is a busy episode, with two primary storylines and several other story points thrown in for good measure. Everything ties into Hawkeye’s letter to Harry Truman. It’s classic Hawkeye, needing an outlet to relieve his anger and frustration. He tells the President about everything going on at the 4077th, from venereal disease to moonshine to a young Korean boy who wants an eye operation so he’ll look more like an American. And he shares how the 4077th got its new hot water heater by participating in a camp beautification project. Colonel Ditka is just the latest in a long line of buffoonish military personnel. He doesn’t seem to care much about medicine or saving lives. “See, you don’t notice it because you’re here every day but to a visiting dignitary this place looks terrible.” Ditka is just following orders, of course. The plot point about Kim Han’s desire to have an eye operation makes me a little uncomfortable. I’m not sure if that’s because it’s sad to think that a young South Korean boy wants to change his appearance or because the line “Koreans are little squirts, Americans are real tough” is so corny. It’s a serious issue and I don’t feel this episode addresses it well. Perhaps with a little more time to flesh out Kim Han, it would’ve worked better. That said, I do like how Kim Han gives B.J. the opportunity to get enraged. Hawkeye fumes about the peace talks but B.J. doesn’t like to get upset about things he can’t do anything about. He can do something Kim Han and he does, getting Margaret to talk to him. Hopefully, she gave him some confidence. How do you think Hawkeye would react to Kim Han asking for an eye operation? There’s a big continuity issue in this episode. Hawkeye finishes his letter, signs and seals it, then asks Nurse Kellye to get it mailed. Yet we then see him writing in the Swamp. Perhaps Hawkeye started a second letter to President Truman. As I always do when a character is shown writing a letter, I wish I knew what Alan Alda was actually writing on the pad of paper. Gibberish that looks like writing? Script ideas? 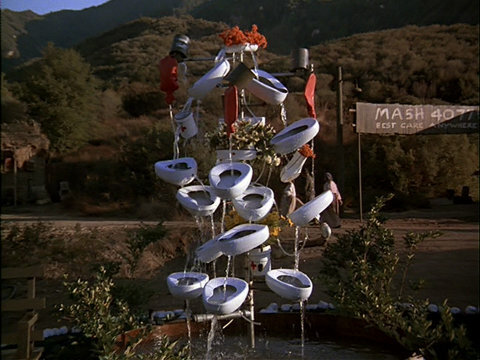 Most of the shots of the beautification project were filmed outside and mountains ca be seen behind the fountain. Notice during the tag scene, however, the fountain is clearly on the Stage 9 soundstage indoors in front of the Officers’ Club. The soldier working on the beautification project who calls Klinger “skyscraper nose” doesn’t receive a credit despite having several lines. I wonder, was Jeff Maxwell unavailable for this episode? We do see Goldman. Another soldier, the one who’s interested in the Korean working girls, is also uncredited. He has a single line. I wonder why Potter thought Col. Ditka’s proposal constituted blackmail. Did Potter hear something in Ditka’s presentation that no one else did? Hawkeye: War may be ugly but it shouldn’t be an eyesore. IMO, a rather bland episode. I always thought it odd that Klinger could hear enough to know that Potter was about to volunteer him for the project “That would be, me!”, but then had to ask why they were beautifying the camp. I’d like to know what happened to the fountain since I don’t think it was seen in later episodes. Destroyed at the end of the episode due to a collision with an ambulance. Curious why the stones and tree weren’t featured in later episodes, though. Also Hawkeye’s anger seems more like the way he would have reacted in earlier seasons. He seems to have forgotten about his trip up to the peace talks. I wonder if Hawk’s line “(If we stay here much longer)we’ll have all of Korea disoriented” was an intentional pun. Yes I think it was. Otherwise it wouldn’t really make much sense to say a war was merely disorienting the Korean people. Did anyone notice that Col. Potter mentioned a commander that made him shine the soles of his shoes? In “The General Flipped at Dawn” didn’t Radar complain that Major General Bartford Hamilton Steele (also played by Harry Morgan) make him shine the soles of the general’s shoes? Probably an accidental one since they don’t keep track of what they wrote in previous episodes. It’s a running joke that the writers didn’t keep a MASH “Bible” of previous storylines so nobody probably would have even remembered that line. Not to mention there are lots of different writers for all the episodes so it’s not as though the same people wrote the lines and might remember. Once again Father Mulcahy’s vanity rears its ugly head. Biting people’s heads off because he looked bad in front of his superor officer by something he knows isn’t in his control. Mulcahy is constantly freaking out about how he looks to others. That’s so against what a priest is supposed to be that it’s silly. It gets on my nerves when we have an episode like the one where Mulcahy cried because he was worrying too much about how he looked at the expense of others. Now he’s doing it again by being rude to the doctors over something even they can’t control. In fact, the argument could be made that a priest might have more of an effect telling staff not to sleep around than a doctor would. I realize the writers and William Christopher probably want to give the character more depth, but the problem is that Mulcahy does these things not even realizing there’s anything wrong with the behavior. I’m guessing there weren’t many devout Catholics on the writing staff. The storyline with the Korean boy wanting to widen his eyelids did seem rushed. I also would have loved to see a full episode about this. But with a different actor. I know he’s been on the show before but at one point he spoke like he was reading his lines and sometimes even looked like he might be reading cue cards. By this point in the show, they certainly would have been able to find a young Asian actor good enough to pull this role off. Everything he says sounds like it came from a B gangster movie so I’m guessing he must obsessively watch only those movies then right? Right? I know it’s supposed to be comic relief from a serious story but it’s such a tired bit by this point in the show that’s not even very funny. You would think with all the drama they’re writing for the show, they would be able to come up with a few really funny comedic bits. The bed pan fountain looked like something you might find in a modern art museum. The juxtaposition of the gross bedpans with the purity of the water is just the kind of thing art folks would love. Wasn’t it strange that Charles hid under the bed when the Turk pulled a gun? I know the writers didn’t keep a log of previous stories but don’t they remember just a few episode ago when Charles took up karate to combat his feelings of cowardice? I guess the episodes are supposed to stand on their own so we have to pretend we don’t know anything about these characters. Was just so soon after the karate episode it came off odd.